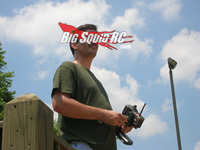 ASK Cub Reporter, 10.25.2012, Version: Serious Questions, Off The Cuff Answers « Big Squid RC – RC Car and Truck News, Reviews, Videos, and More! Cubby– Hey thanks for the props Patrick, shoot Brian your snail mail and he’ll send ya some of our sic BSRC stickers to plaster all over your rig. Sounds like you are no “average” user Pat. Most “average” users have never taco-out a 4S hard-case Lipo from casing a quad, or nearly sheared the top half of a 4S off from a brutal frontal hit, but it sounds like you have. Funny, we seem to have that same problem around the office. LOL It is truly amazing the amount of g-forces that an 8th scale buggy can generate on track or when doing extreme bashing. We generally don’t have problems in 2S applications, but nearly every 3 and 4S hard case Lipo we use gets destroyed sooner or later due to g-force damage. Their cases eventually get mangled and the cells inside get deformed, leading to the death of the pack. Unfortunately there is no such thing as an “indestructible” battery, never has been, never will be. However, there are some things that you can do at the consumer level. One example is the MaxAmps stainless steel battery tray insert. (seen here). This is essentially a peace of steel that prevents your Lipo’s plastic hard case from being destroyed during big hits. At the manufacture level there are a couple of things that I would really like to see done. The reason our hard case 4S Lipo’s are getting destroyed is because battery boxes in our 8th scale buggies (and truggies and SCT’s) are too short/low. A 4S pack can be quite tall and I’ve yet to find a battery box that even comes close to being tall enough. The taller the battery box, the less likely a 4S hard case Lipo is going to be deformed/destroyed during a high g-force event. The second thing that can be done at the manufacture level is to use thicker cases on the Lipos they sell. Some companies use thicker cases than others, and some are downright too thin, but all could stand to be a millimeter or 2 thicker. Thin cases are cheaper and give more room for the cells inside, but adding another millimeter or two of thickness to a hard case would go a long ways towards keeping their packs alive. To finally actually getting down to answering your question- which Lipo is most durable? We’ve physically destroyed every brand we’ve laid hands on at one point or another. What I recommend to you is- follow all the normal Lipo safety rules, plus adding more protection in strategic places. For example, if you are always blowing out the front of your 4S packs due to heavy front hits (this is the most common), add an extra piece of plastic in front of the pack or use the MaxAmps steel battery tray insert. Can you please allow commenting on ALL of your articles? I would love to see other people’s thoughts on the posts and be able share my own. Cubby– Hey what’s up Justin? We’ve kicked that idea around for quite some time, but this is what it boils down to- there are plenty of upsides to having the comments turned on, but only one downside. On the upside it would generate more traffic, generate more conversation, and be more fun (among other things). On the downside, a comments section on any form of website eventually turns perfectly good people into drunken sailors- arguing, cursing, posting racial slurs, threats of physical violence, etc. Brian has always attempted to keep BigSquidRC a family website, a site that no parent would have a problem letting their 11 year old aspiring factory pilot read on a daily basis. If comments are turned on all the time there is no way we could monitor and clean up all the crap that would eventually end up on there. If this was my site I’d flip comments on and never look back, but thankfully this is Brian’s site. Rc should be a family sport/hobby, therefore the leading rc news/reviews site on the web (yes, that is us) should also be family oriented. That’s it for this week ya bunch of nut jobs. Thanks for sending in so many emails lately, we are quite flattered, but feel free to keep them coming! Each email that hits the big-time on the front page gets free stickers, and if for some crazy reason I pick yours as letter of the month we’ll shoot ya out an uber-sic BigSquidRC t-shirt. Send me your emails to Cubby at BigSquidRC dot com.